And what is “the season”? For some boaters it’s two seasons—spring and fall. For others it’s one season—fall/winter/spring. And hey, for some people who boat in frigid coastal or northern waters, it’s year round. Whichever category you fall into, whatever type of boating you do, if you’re going to boat on cold water you need to plan how to dress to stay safe and warm. 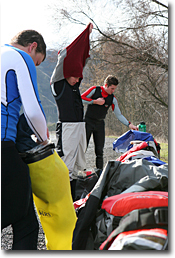 Terry, Jon and Casey shedding layers after an NRS spring boating trip. Simple as that. Read what Charlie Walbridge has to say in “Cold Water Protection and Hypothermia”. In addition to that danger, if you’re not well dressed and prepared, you’ll be cold, wet and miserable. Please read “Cold Shock: 5 Golden Rules for Boating in Cold Water.” Written by Moulton Avery, the director of the National Center for Cold Water Safety, it provides vital tips for surviving a swim in cold water, that silent predator waiting to kill the unprepared boater. Learn from others with experience of your local conditions; talk to friends, members of local boating clubs, local paddlesports dealers, boating forums like BoaterTalk, Mountain Buzz, and Paddling.com. Once you’ve done your research and answered the questions listed above, you’ll need to make your choices of base layers, insulating layers and outer layers, as outlined in “Layering for Cold Water Boating”. Getting combinations that work well for you and the conditions in which you boat makes all the difference in your comfort and safety. There are many different choices and options available to boaters. Again, your local dealer can really help you with the decision process. Or, give us a call here at NRS, 877.677.4327. Remember, a friendly, knowledgeable person answers the phone when you call—no annoying phone trees. It’s easier to help you through a phone call, but we also work with you via email, service@nrs.com. Don’t forget about your extremities when building your gear bag. Although we exposed the “you lose most of your heat through your head” myth in “How to Stay Warmer with Proper Paddling Headwear”, you’ll enjoy the warmth you get with a Mystery Head Warmer. Your hands and feet are farthest from your heart and lose heat quickly. You’ll need neoprene gloves, water shoes and wetsocks for protection. As snow comes a drifting down, George gets suited up for NRS swiftwater rescue training in the icy Potlatch River. Protecting yourself when boating in cold water involves more than making the right apparel choices. In “Nutrition: Fueling the Fires Within ” we explain in-depth the nutritional and hydration needs your body has in order to function efficiently in cold weather. While you’re preparing yourself for cold water boating, think not only about yourself but also of the safety of people you boat with. Are you dressed well enough to go into the water to help rescue someone? If a member of your party is injured, will your apparel choices, either worn or carried along for emergencies, be adequate to wait with them until help arrives, perhaps even overnight? Boating when the water is cold often opens up 50–75% more days for boating. When you’re properly protected, you can have a great time. Usually, there are fewer people on the water then, you see more and different wildlife and the scenery can be fantastic. The key phrase there is “properly protected.” If you’re not, at the very least you’ll be uncomfortable and won’t enjoy the trip. At the worst you become one of those statistics we read about. Be safe, be prepared.